Pin Paper with Text || paper, straight pins || 10' x 6' x 2"
In “Theories and Documents,” Mark Cameron Boyd paints his own sentences as the subjects of his visual works, and through this practice, Boyd investigates text as a language for painting. Boyd’s art making process is directly apprised from his teaching and reading of art theory texts. 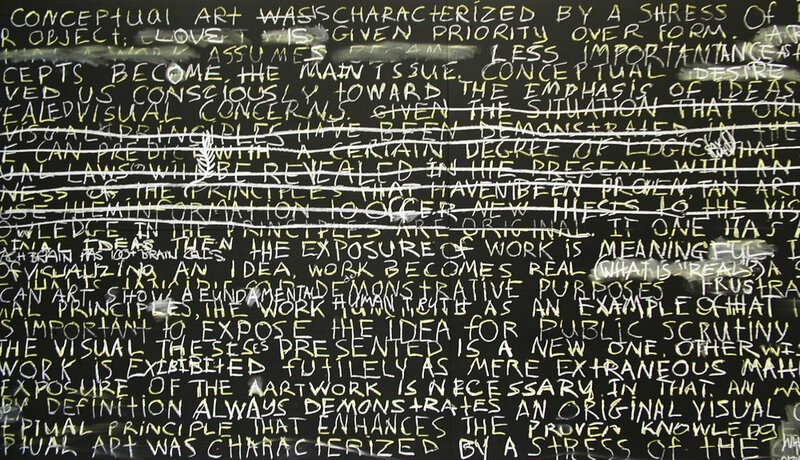 In Boyd’s latest series, “Documents and Theories,” he creates numerous 4 x 6” blackboard panels on which drawn notecards are copied verbatim from his teachings of contemporary art theory, then, bisected. Also included in this body of work are large interactive panels that engage the viewer to read, decipher and literally complete the meaning of the text. Drawn to construction or demolition objects, such as welding rods and chain-saw chains, that distinctly carr an air of strength and power, yet are disposable, Christian Benefiel disunites these objects from their working ensemble and preserves them in iron or paper. The natural chemical processes that render these objects useless in the first place, have, in turn, preserved them from their destruction. In his mélange of sculptural works, Benefiel has constructed a bread market, although the bread is iron-casted. In this installation, Benefiel uses two universal staples of culture – bread and iron – and demonstrates that both commodities share the same qualities of market-driven consumption. Leah Frankel deliberates over the functionality of language in this quickly amalgamating world. Employing hundreds of books written in many different languages, Frankel transforms these pages and shells of the books into a visual imagery that, in her eyes, is far more expressive than the bounds of language would ever allow. 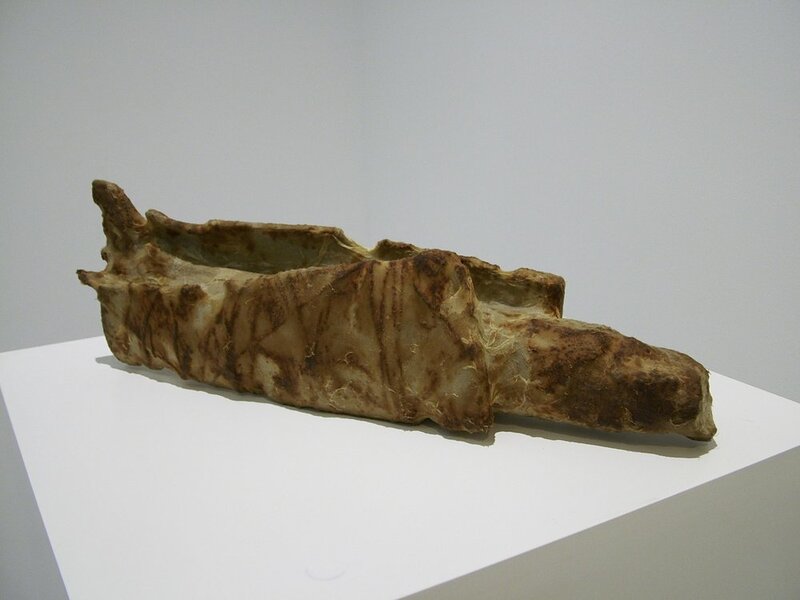 Ripping out page after page – releasing them from their “binds” – then manipulating them in wax, Frankel authors a new contextual environment of organic, repetitive forms that are born from the text that she now deems secondary.